For such a solitary pursuit, it’s surprising how motorcycles bring like-minded souls together. 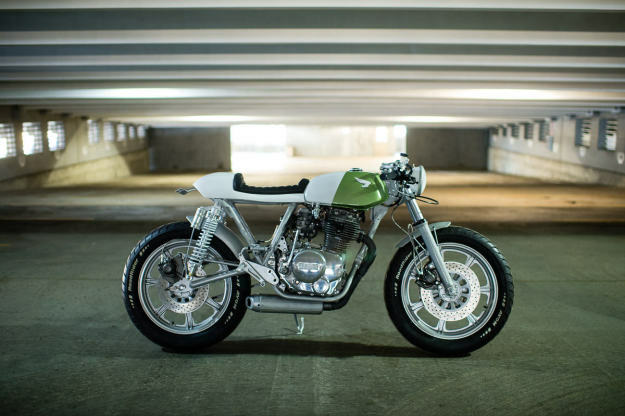 But this Yamaha XS400 goes one step further: it helped start one of western Canada’s leading custom workshops. Randy’s XS400 has since changed beyond recognition. Yes, it looks gorgeous, but its beauty is more than skin deep. 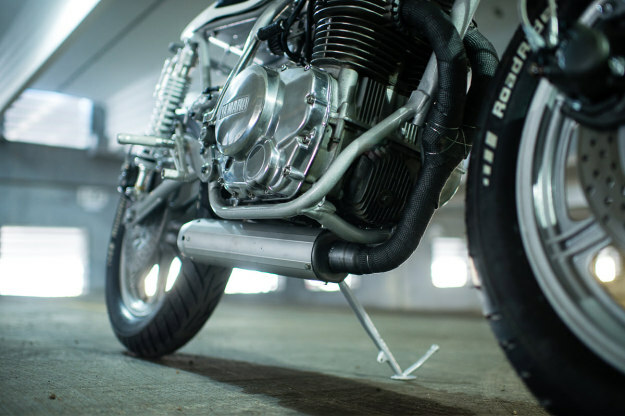 There’s an extensive list of mods, starting with XS1100 forks (shortened over four inches to fit) and RFY shocks at the back. 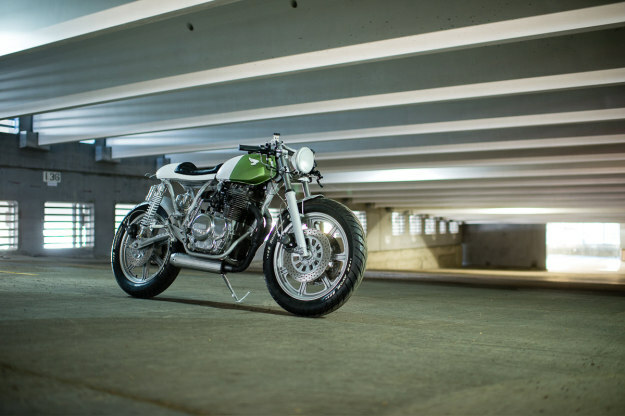 Federal have swapped out the original gas tank for a 1969 Honda CL350 tank, painted white and sea foam green. 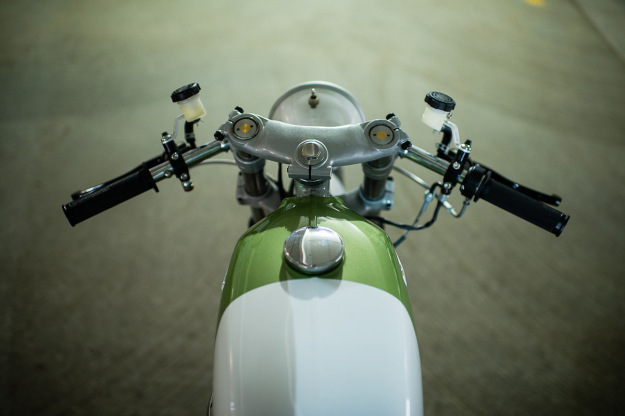 Up ahead are clip-ons and Tommaselli grips, a Biltwell ‘Whiskey’ throttle and 12-millimeter push-button switchgear. Upgraded levers connect via stainless lines to a hydraulic clutch and a Brembo master cylinder. The front brakes have been replaced by a twin-disc setup, and there’s a disc at the rear instead of the usual drum brake. The rotors have been drilled. The wheels are 18-inch mags from an older XS400, shod with grippy Avon Roadrider tires. They’re an increasingly popular choice for custom builders wanting more grip than vintage pattern rubber usually provides. The fenders are made from scratch, hand-rolled on an English wheel, and there’s a new seat unit topped off with with leather from Alberta’s H&E Upholstery. A tiny strip of LEDs at the back of the tail unit takes care of lighting. 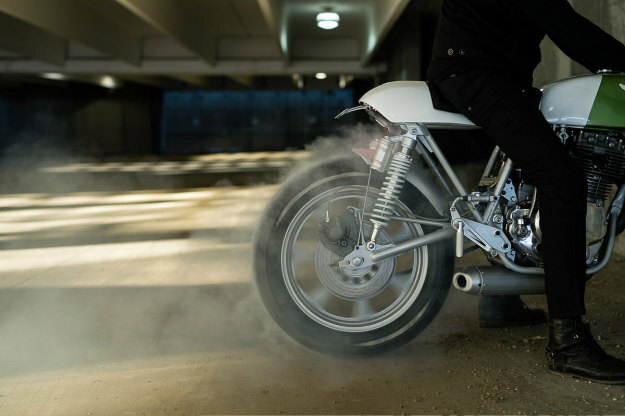 The custom 2-into-1 exhaust system is tucked in close, with gases exiting via a modern dirt bike muffler. On the induction side, the air box has been replaced by K&Ns. Keeping everything looking tidy is a new electrical system from Wire Wizard of Vancouver. It’s hooked up to a four-cell Antigravity battery, and there’s a discreet digital voltmeter built into the rear of the gas tank. 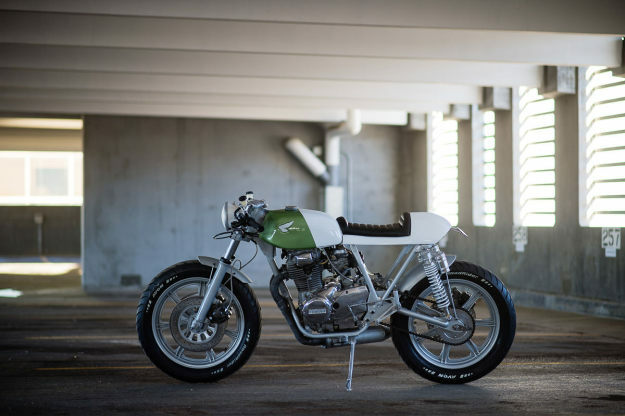 It’s one of the best XS conversions we’ve ever seen. Keep an eye out for the Federal Moto name, because these guys are going places. Federal Moto website | Instagram | Facebook | Images by Dong Kim.